Our Department is committed to supporting our students through their IFP year and beyond, to this end we would like to establish a network of our Alumni. The purpose of this would be to allow all of our past students to engage with each other, both socially and with a view to encouraging and supporting employment opportunities in the future. 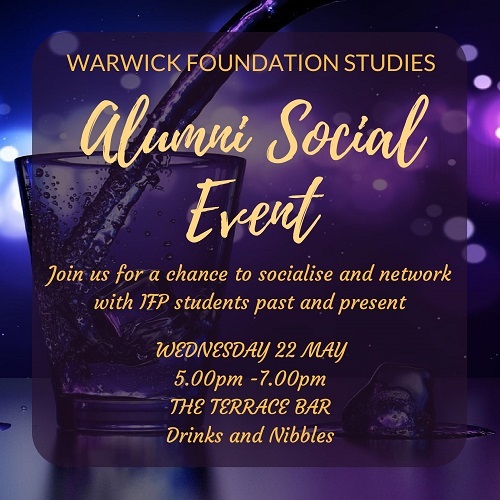 We are hoping to set up an IFP Newsletter Summer 2019 for all Alumni and an IFP Society based at Warwick for Warwick Alumni from October 2019. We also have a Linkedin group which we encourage you to join. We would love you to attend our Alumni Social event on 22 May. We really look forward to hearing from you and meeting you at upcoming Alumni events.